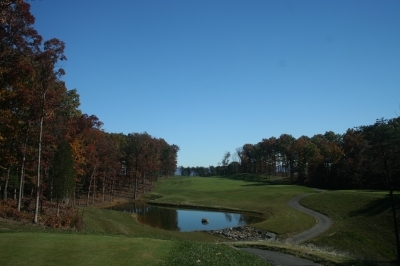 FRONT ROYAL, VA – If you’ve played golf for a long time, you’ve probably learned just because something’s new doesn’t always make it better. 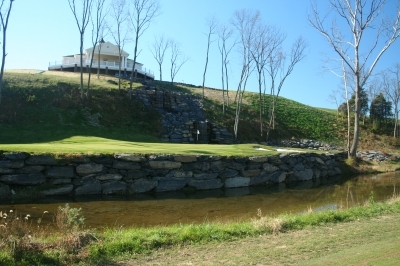 The second shot on the par four 1st hole plays downhill to a green guarded by a rock wall-lined pond. How many times have you tried a new golf course or bought new equipment only to discover there was nothing ‘new and improved’ about the experience at all? For that reason, we approached a visit to the new Blue Ridge Shadows Golf Club with a healthy dose of skepticism if not downright apprehension – after all, it’s about an hour drive for us near the beltway dwellers, and we’re used to a pretty nice menu of local golf to feast on without going to the trouble of leaving our suburban environments. Fortunately, Blue Ridge Shadows made it worth the trip. 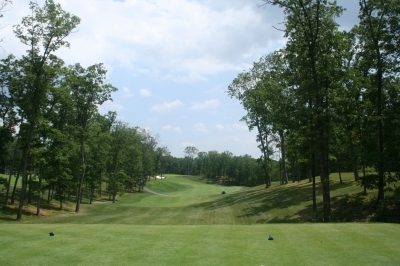 This new (opened in March of 2007) Tom Clark (of Ault, Clark & Associates) design offers more than just a scenic drive to the Shenandoah Valley – it’s a truly unique golf course that’s got a little bit of everything for Mid-Atlantic golfers looking for someplace close but definitely ‘far away’ in feel and appearance. There's trouble all around off the tee of the par four 15th hole - it's a good thing the fairway itself is pretty wide. Blue Ridge Shadows offers two distinctly different nines on its golf course with an undulating, hardwood-lined front nine and a more moderately sloped (or downright flat on many of the holes) backside where you’re contending with all the water you’ll care to see for a game that’s supposed to be played on dry land. After playing it, you’ll certainly note the plethora of different looks on the course as well as a diverse set of shots the layout requires. 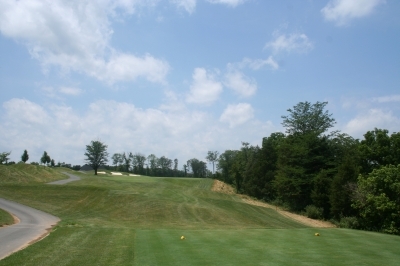 Every Golf Club brags that their course has eighteen different challenges – but at Blue Ridge Shadows, they mean it. Play a fade off the tee of the par five 4th hole - but if you go too far right, you're reaching for another ball. In these days of personal excess, government ‘stimulus’ and exploding deficits, the notion of fitting everything in for a price is foreign to many people, but not Clark. Clark was taken with the challenge of the assignment and the beauty of the site itself, so he didn’t let tight acreage and a firm budgetary line scare him off. It’s not often that golf courses are built just for the duffers, but Blue Ridge Shadow fits the bill – and you’ll see other golfers along the way without having to think about someone’s backyard barbeque. Cross this bridge to reach the green of the par five 14th hole. This hole requires three extremely accurate shots to leave a chance at birdie. The flood plain Clark was talking about, which holds much of the back nine, had formerly been used for pasture land and is basically dead flat. It did (and still does) contain a nice meandering stream (Crooked Run) flowing through it, but Clark said the area still needed additional ponds for irrigation and to provide fill material for drainage. It doesn’t take an engineering degree to see that a flat piece of land at the base of a steep slope would tend to get muddy after a little bit of rain. Hence, seven of the closing nine holes have water hazards. All that drainage water has to go somewhere. And then there were the cost issues. 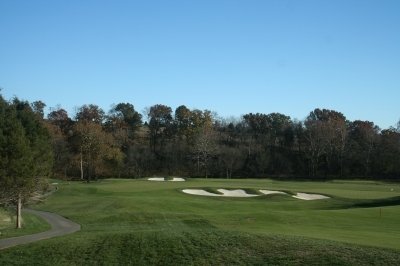 “With the upper portion of the property completely wooded and some severe topography, and the lower part needing to be drained and graded, we had to really work to keep the clearing and grading costs to a minimum, yet still leave a playable golf course,” Clark added. The par three 5th hole looks pretty benign - but at 234-yards from the back tee, it's actually a sizeable challenge. In addition to the ‘big’ concerns there were smaller considerations, such as wetlands mitigation and oddly enough, building bridges. There were four bridges that had to span the creek without support in the channel, and a load of other restrictions on fill material so that it didn’t impact an adjoining road from the practice area. Blue Ridge Shadows sounds like an engineer’s paradise. Those practical items weren’t the only things Clark and the owners had to worry about, either. Clark says the area’s existing golf facility competition mandated that they build a course that would stand out on its own – no small consideration when there’re older and more established neighbors tapping into your potential clientele. Everyone’s competing for the dollar – just an added bit of pressure. At 489-yards, the par four 13th hole would seem manageable only for the pros - but it plays downhill the whole way, and is a beautiful sight once you get there. There was one other unusual aspect of Blue Ridge Shadows that Clark shared: “It was the first project where the owners kept the golf course and commercial area, and sold the housing development (usually it’s the other way around). Building the commercial area (where the adjoining hotel is located) also affected the golf construction, as the project needed additional fill dirt – and it had to come from the golf course flood plain. Clark is especially proud that the finished product was a golf course that plays over 7300 yards from the back tees and challenges the best players (slope of 143), yet the forward sets are still gentle enough to allow shorter hitters to have a good time. In fairness, there are a couple holes where beginners and short-hitters will struggle no matter what – the par three tenth hole comes immediately to mind. The hole plays across a ravine from the back tees and is severely uphill from the forward sets – a chasm that’s a mighty battlement for the power challenged. Head Golf Pro Mike Ahrnsbrak says the par four 7th hole looks like 'God created it hundreds of years ago.' It's hard not to agree. Blue Ridge Shadows’ superintendent will keep the conditions firm and fast, too. He’s Vince DiStefano who previously worked at the famous Shadow Creek Club in Las Vegas (a Tom Fazio design noted for its immaculate playing conditions in the midst of a barren desert). True to Ahrnsbrak’s prediction, the course offered some of the best conditions you’ll find anywhere. Looking back from the green of the challenging par three 10th hole. From this view, it's hard not to feel like you're on top of the world. Our favorite holes on the layout included the first hole, a 411-yard par four that’ll introduce you to Blue Ridge Shadows’ best attributes very quickly. 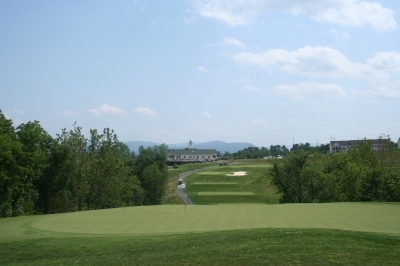 Looking from an elevated tee, you’ll enjoy the scenic views of the Blue Ridge Mountains and Skyline Drive while choosing which side to play to on the split fairway. 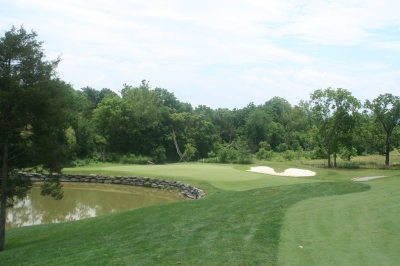 The second shot drops dramatically to a large green guarded by a pond front and left. The par four seventh hole also stood out. “Because it’s framed by mature hardwoods, this hole looks like God created it hundreds of years ago,” Ahrnsbrak says. The hole slopes left to right, and the best strategy off the tee is to play for some bounce off the slope for extra distance. The second shot is uphill to a two-tiered green. Moving to the backside, the par four fifteenth hole’s tee shot is definitely one of the most dramatic at Blue Ridge Shadows. 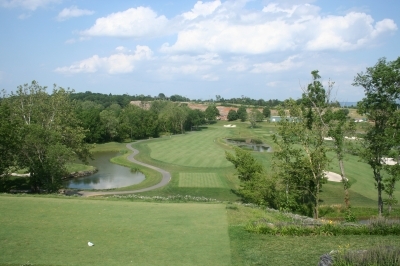 You’re teeing off the bluff near the clubhouse, and you’ll need to find a fairway framed by two ponds and Crooked Creek running down the entire left-side. Again, the second shot is slightly uphill to a two-tiered green. There isn't much water on the front nine, but there's a pond in view from the tee of the par four 8th hole. So Blue Ridge Shadows is a getaway within a getaway – not bad for the new kid on the block. The green of the par four 18th is not an island, but it might as well be if you've missed the putting surface by much in any direction. Blue Ridge Shadows should take away all the apprehension you might feel from trying something new, because in at least one case, ‘new and improved’ has definitely found its meaning. Note: The photos for this article were taken over two different visits, one in November, the other in June. 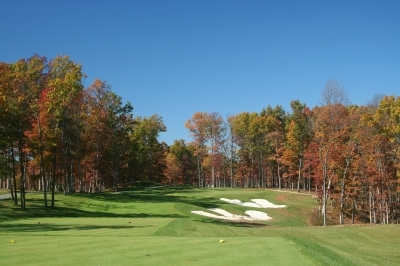 As noted above, Blue Ridge Shadows offers many different views – but not even this beautiful course could look like fall and summer at the same time. Weekends/Holidays $75, $54 twilight (3pm). Twilight adjusts with amount of daylight left and starts in the winter at 12pm. Off-Season rates are $55 weekends, $39 after 12pm or $39 weekdays, $29 after 12pm. Note: Walking is permitted at any time. 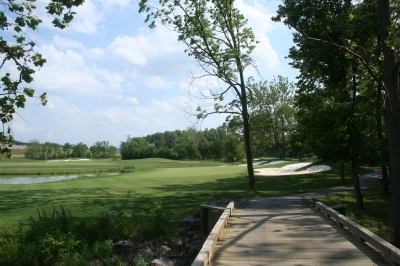 Rankings - Rated #6 Best New Affordable Public course, 2007 by Golf Digest Magazine.